I love sweet potatoes, especially the texture. 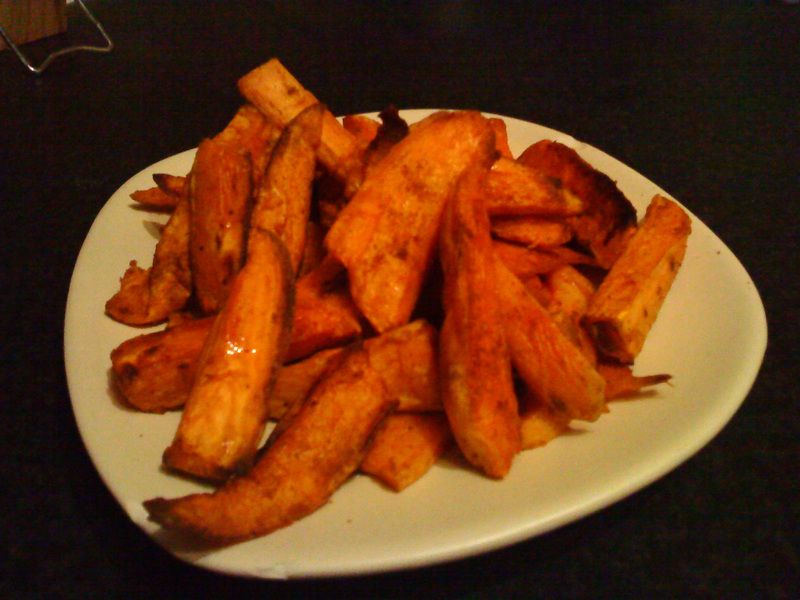 Which is why I love them cut into chips – when they’re baked in the oven they give you a slightly crisp texture on the outside and when you bite into one they reveal that lovely soft velvety goodness. Heat your oven to 180 degrees celcius. 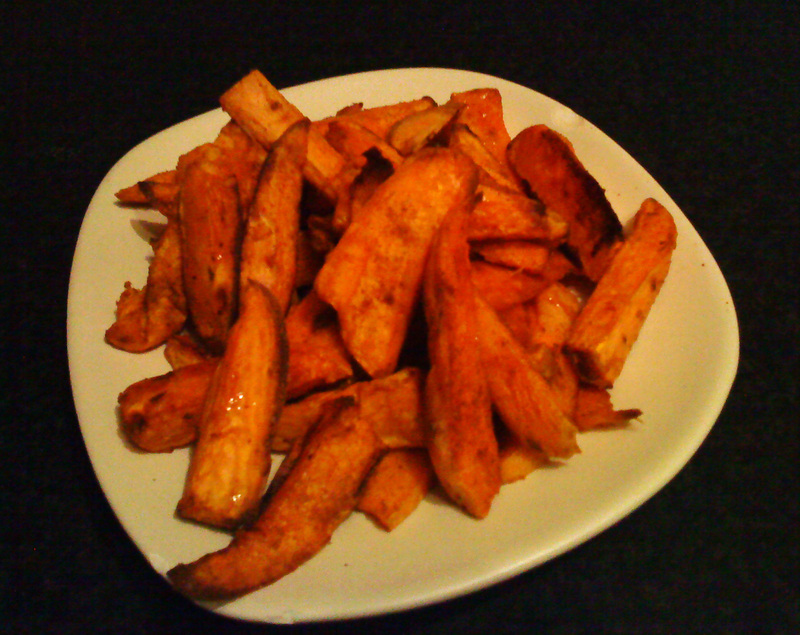 Peel and slice the potatoes into roughly 1.5cm chips. Toss in about 1/2 tbsp of olive oil. I then sprinkle over some sea salt and some ground cumin and toss. Place in the oven and bake for 35-40 mins, remembering to toss half way. Alternative flavours: sea salt & pepper, chilli – I’ve found both work great but my favourite is the one above. I have at least one of these every time I go to France. They’re just so damn tasty!! For some strange reason I never attempted to make one before, until now!! They’re so easy to make and I nearly always have the ingredients in the fridge. They’re typically made with bread, Dijon mustard, ham, Gruyère cheese and a béchamel sauce. Now I had everything but the Gruyère so I substituted it for the mature white cheddar that was sitting in the fridge. 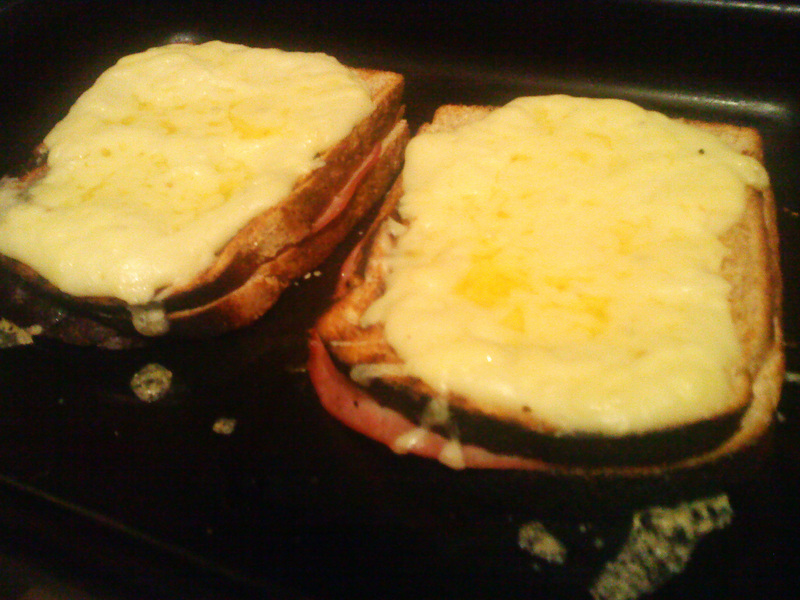 Very very easy to make; at its most basic it’s a toasted ham and cheese sandwich, topped with a béchamel sauce. To make the béchamel sauce: melt 2 tbsp of butter in a small pot on a low/medium heat. When it has melted add 2 tbsps of flour and stir with a whisk until smooth, this should take about 2 minutes. To this, gradually add about 300ml stirring consistently until smooth and thick. I then added salt, pepper, nutmeg and roughly 1 ounce of grated cheese. Remove from the heat. Then make the sandwiches. 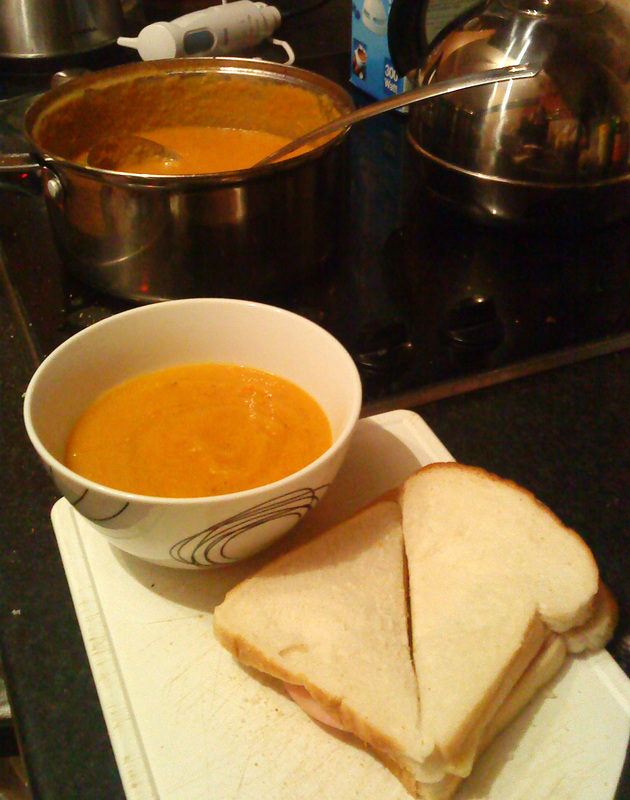 I made two ham, cheese and Dijon mustard sandwiches on whole meal bread and buttered the outside of them. You can them toast them on both sides on a pan, I used a heated griddle pan for this. This does not take long providing the pan is hot to begin with. Remove the sandwiches from the pan and place in a baking tray. 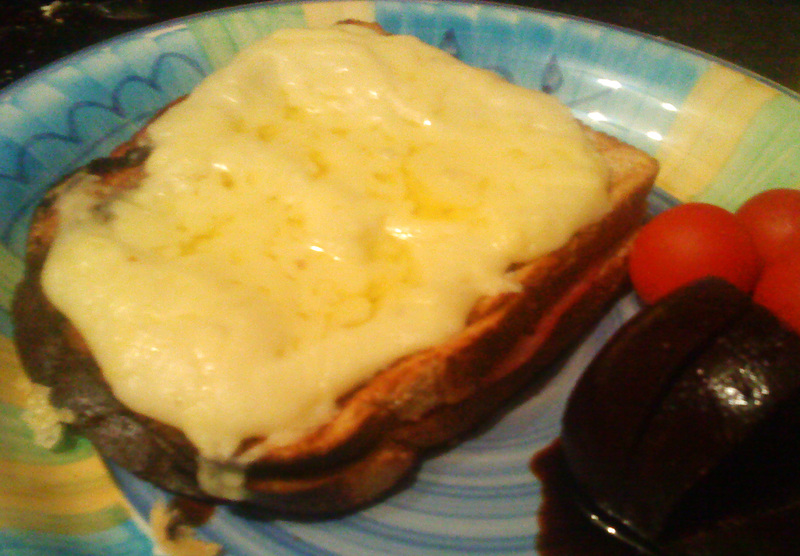 Spoon on some béchamel sauce on the top of both sandwiches. Sprinkle both with grated cheese. Place in the oven for roughly 5 mins until the cheese has melted. You can then put them under the grill if you wish to get a nice browned top. I did not do that this time but I plan on doing it next time. I will also use Gruyère cheese in my next attempt as I felt it did lack that distinct flavour. If you add an egg to the middle of the bread you have yourself a Croque Madam, think I might give that a shot next time! I adore Pizza and will never say no to it!! When I never know what I want to eat, I’ll always be in the mood for pizza, it’s incredibly tasty. Things I don’t like on pizza: onion, fish/shellfish. I’ll pretty much give everything else a go! Things I love on pizza: pepperoni and pepperoni! Drool!! This home-made pizza recipe is one I scribbled down whilst watching Jamie Oliver. It’s absolutely fool-proof and works every time. I always make a large batch as per the recipe below and then freeze individual portions of the dough and sauce. 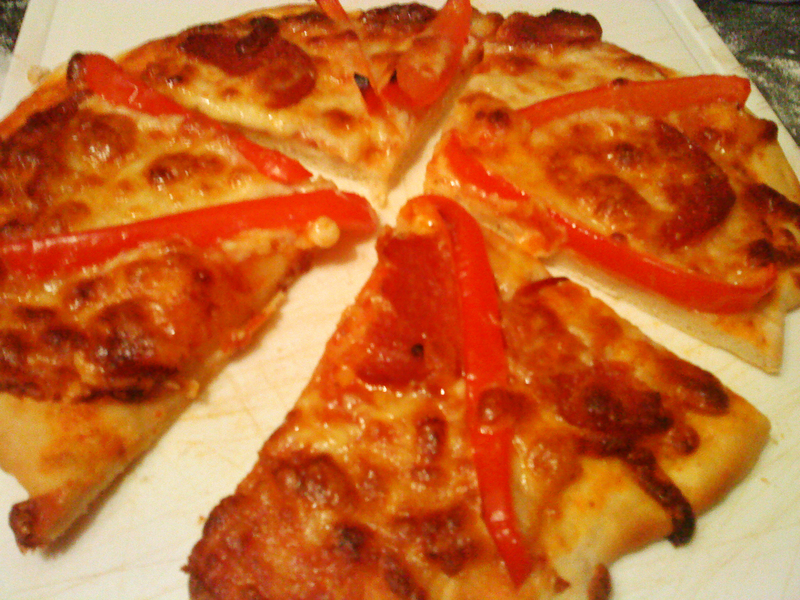 It’s so handy and far better for you, frozen pizza are full to the brim of salt, major no-no. It’s a very handy dinner to make mid-week. In the morning you can remove your frozen serving and then just roll in the evening and add what you have to it! Heat 6tbsps of olive oil and add three thinly sliced garlic cloves to this. Add in some fresh chopped basil. Pour in three cans of chopped tomatoes. I throw in some chilli here too if I’m looking for a kick form the sauce. Simmer for five minutes. Sieve to remove any lumps and return the sieved sauce to the heat and simmer gently for another five minutes. 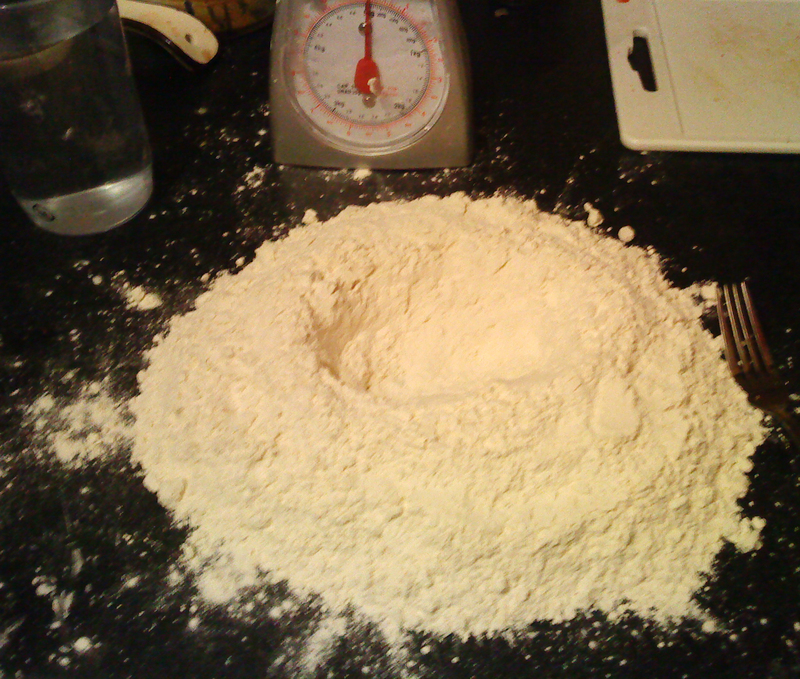 Mix 800g of strong flour with 200g of semolina and 1level tbsp of salt. Sieve this on a flat surface and make a well. In a jug, mix the 14g yeast, 1tbsp sugar and 4tbsp olive oil into 650ml lukewarm water and leave for a few minutes, then pour into the well. Work in the sides with a fork, when it starts to form, work with hands and knead. When a ball forms place in a large bowl, cover with a damp tea towel and allow to rise for an hour. When this is ready, tear off a portion and roll or toss if you can. Spread about 2 dstsp of the tomato sauce on it. Add mozzarella and whatever else you like. I added pepperoni and red peppers and freshly ground black pepper to my most recent pizza. 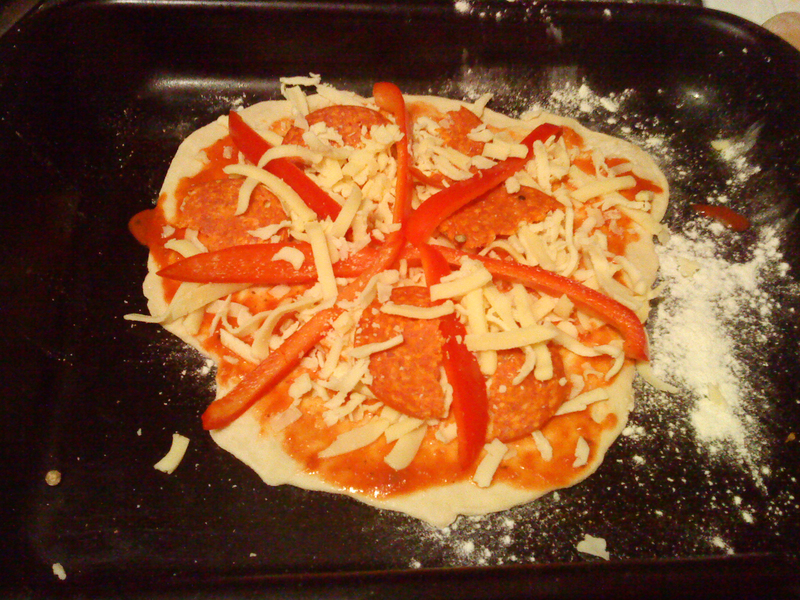 I'm yet to make a perfectly shaped pizza! Cook at 180 degrees celcius for 15 -20 mins depending on how thick/thin your base is. Work has been so busy since the Christmas break, the weather has been miserable and it is so hard at times to get motivated to cook dinner when I return home in the evenings. This is so quick to throw together and really hits the spot. I actually had no idea what I was cooking when I started putting things together. There was chicken in the fridge and I spotted some brocoli and there was some left over white wine from the previous weekend. I diced two breasts of chicken and seasoned them with salt and pepper. Having heated some olive oil in a pan I added a chopped clove of garlic and the diced chicken. 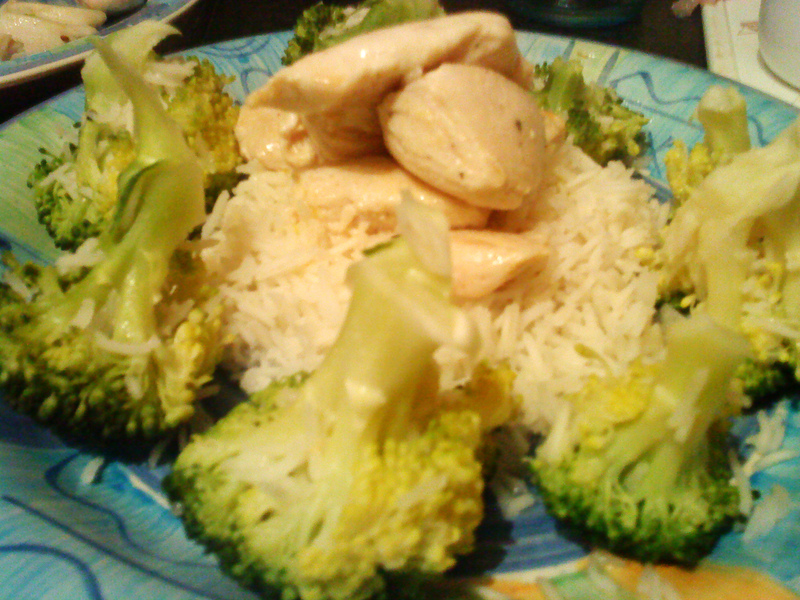 At the same time I put on some basmatti rice to cook and some brocoli. When the chicken was cooked (this only take about 5 mins depending on the size of your pieces, be careful not to over cook, there is nothing worse than tough, chewy chicken), I removed it from the pan to a plate leaving the juices and the garlic behind. I added a cup of wine, a cup of chicken stock and some cream (add as much or as little as you like, I tend to lean towards less with cream) and simmer gently until the alcohol burns off and the sauce thickens. 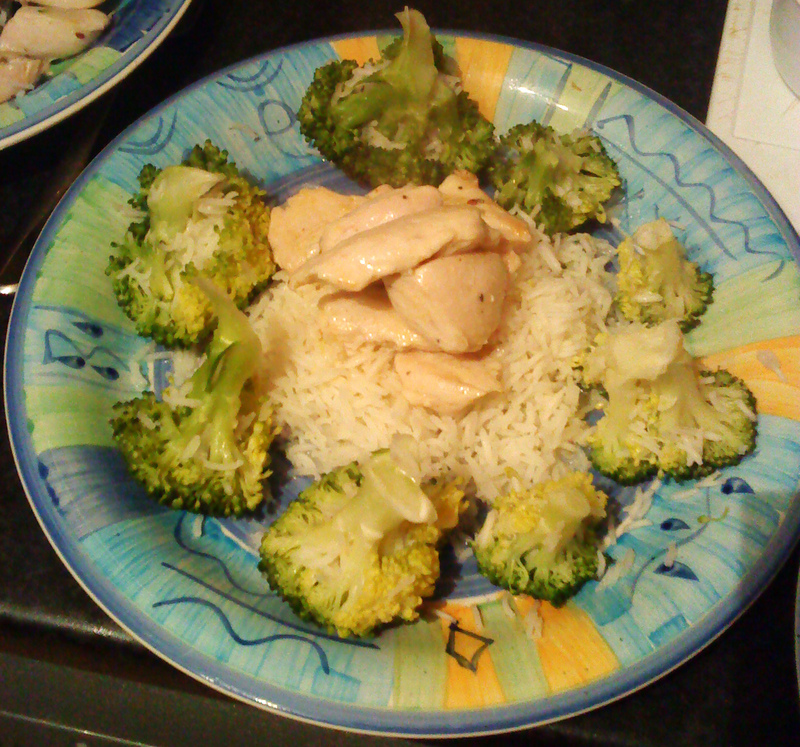 You can then either add the chicken and brocoli to this or pour the sauce over both when you plate your food, depending again on what you like! So quick to make and it really did hit the spot!! I think it would also be great served with linguine and garlic bread. I seem to be having a bit of a blueberry craze lately. They’re just so tasty. The recipe for the pound cake is the same one I used for the Nutella version, that worked so well that I wondered what it would be like with fruit. 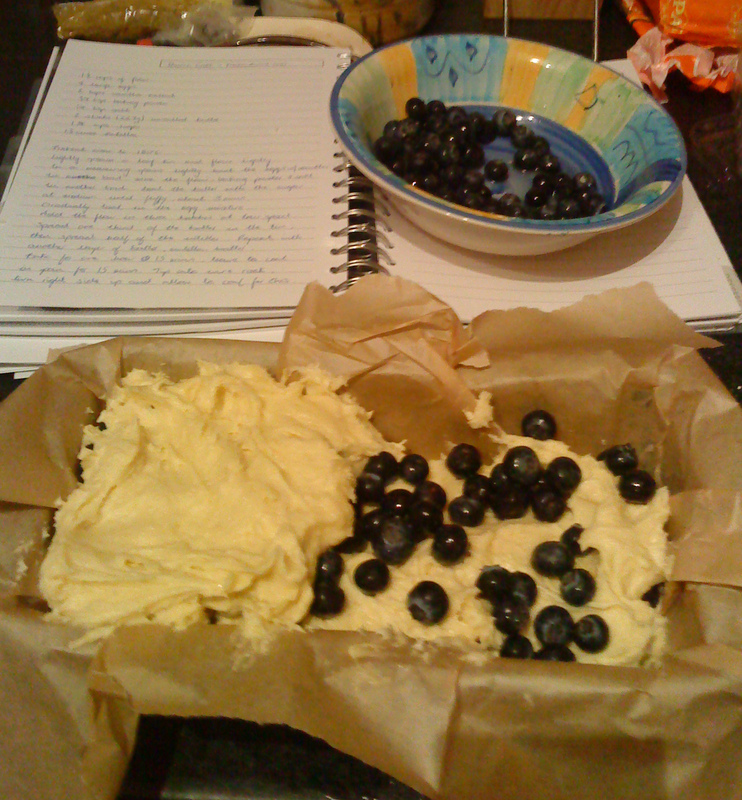 I soaked some blueberries in some sugar and a squeeze of lemon and this highlighted the flavour so well!When layering, I poured some cake batter in first, then blueberries, batter, blueberries batter. 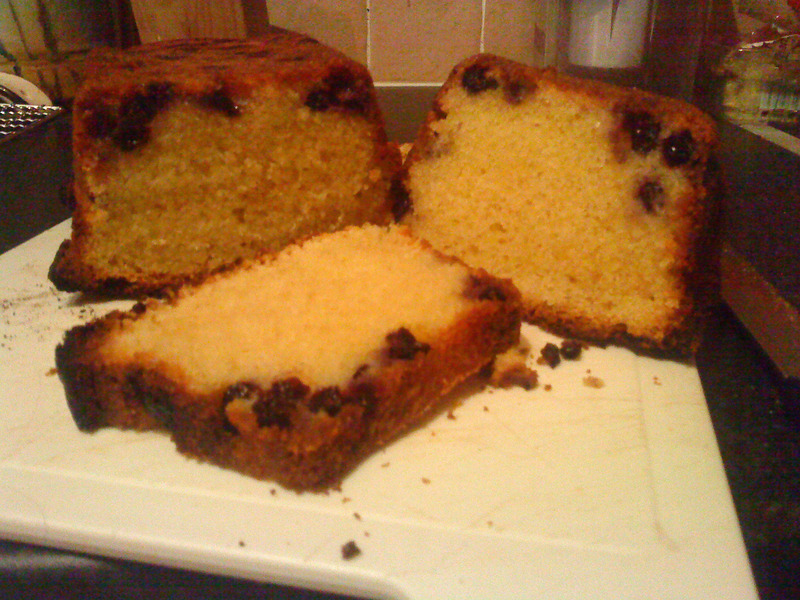 Regardless of this, the blueberries seemed to sink to the bottom! Who knows why?? The only problem with this cake is the length you have to wait before tucking into a slice with a big cup of tea! It is most definitely soup weather. We are enduring the coldest weather for 30 years, it is now minus 2 degrees outside and there is no sign of it getting any warmer any time soon. We had a delicious roast chicken dinner the other day (my all time favourite dinner) and so there was a carcass to use. To make the chicken stock I added the carcass to the pot along with water, a few pepper kernels, two bay leaves, three sticks of celery chopped, two carrots, a potato and an onion chopped. This was left to simmer gently for a few hours. The chicken bones were then removed and I was left with a lovely broth. To turn this into a hearty soup for the weather, I roasted about 5 carrots with a dstp of honey and a sprinkle of coriander. I then added them to the stock along with a dstp of ground coriander (add a little at a time and taste as you go), salt and pepper. Blend well and serve. We have just eaten; I am full to the gills after just one bowl and already looking forward to enjoying it for lunch tomorrow. Happy New Year Everyone! We had a delightful snowy New Year’s Eve! I love snow; we made a snowman whilst sipping champagne and ringing in 2010 last night. 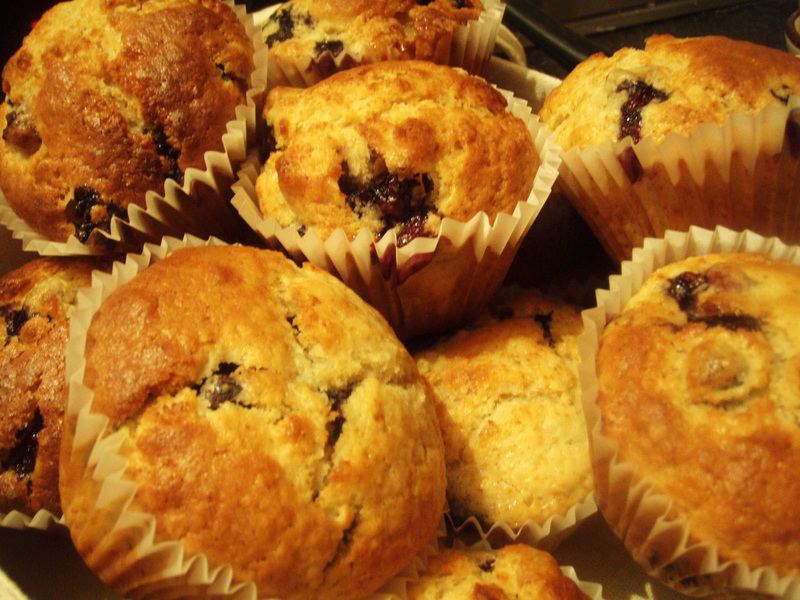 It’s a chilly, icey day outside, the shepard’s pie is in the oven and the blueberry muffins are just out. 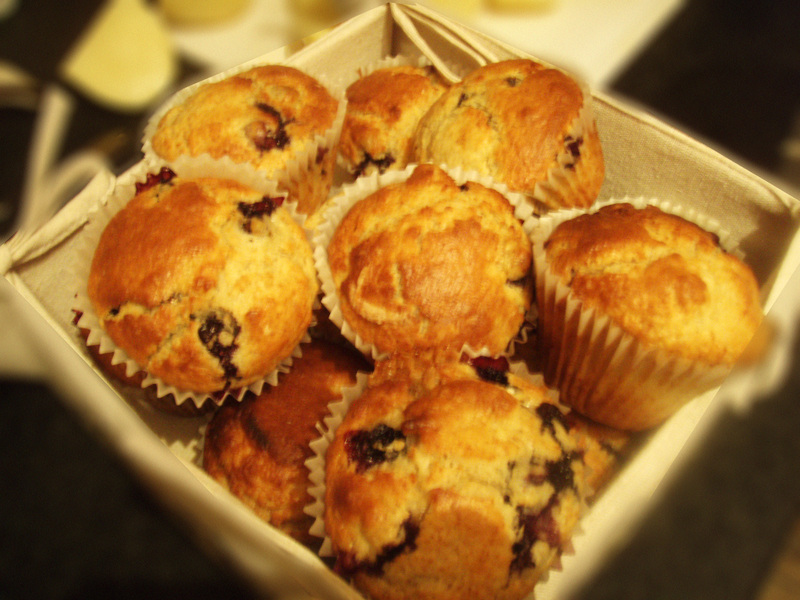 I recently bought a book of muffin recipes as I am trying to find the ultimate muffin recipe. It can be so hard to get that lovely moist texture. 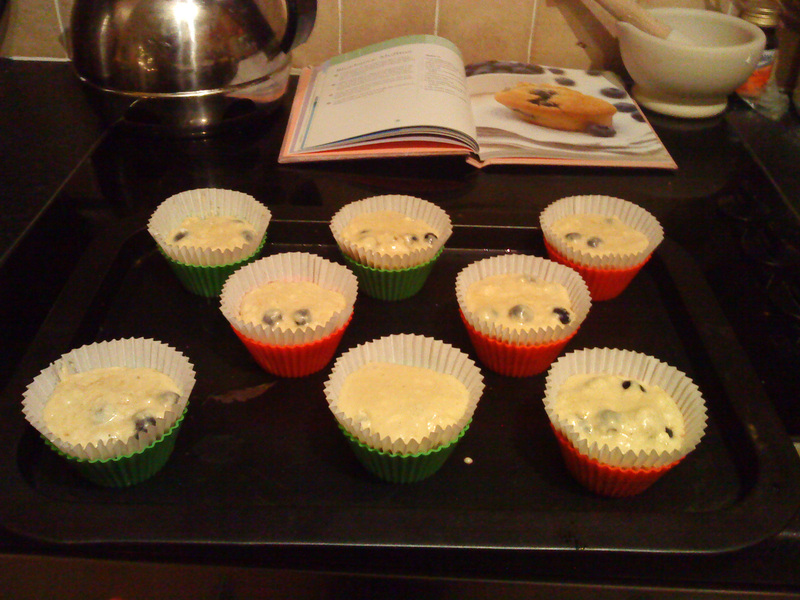 I’m hoping this batch turn out, I can promise that they smell amazing and I am dying to try one! 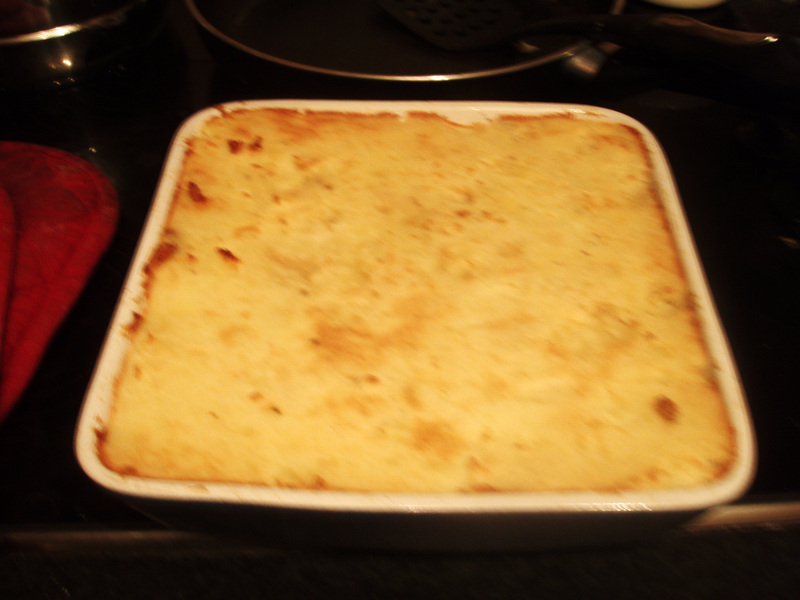 The Shepard’s pie (another gem from the Avoca Cookbook) turned out heavenly, the perfect dinner to tuck into on a chilly January night. Since I first made this pie a few years ago I haven’t strayed from this recipe. It’s simply too good to even contemplate making a different one. I guarantee you will fall head over heals in love with it, just as I did! In a large pan, heat some vegetable oil and gently saute one diced onion until soft and lightly coloured. Add the mince (1lb) a little at a time and cook until browned. Dilute a dessert spoon of bovril in some hot water and add to the mince mixture and stir well. Then add 3 tablespoons of worchester sauce, 1 teaspoon of tomato puree, 3 diced carrots, s sprigs of thyme and 400ml of chicken stock (I use the knorr stockpots as I find those cubes too salty). Season with salt and pepper. Simmer on a low heat for 50 minutes. When this has been cooking for approx. 30 minutes put your peeled, chopped potatoes (5 or 6 depending on size) on to boil. Drain well and mash with. I always mash with salt, pepper, butter and milk, though you can use cream or an egg yolk if you wish. Preheat your oven to 180C/350F. 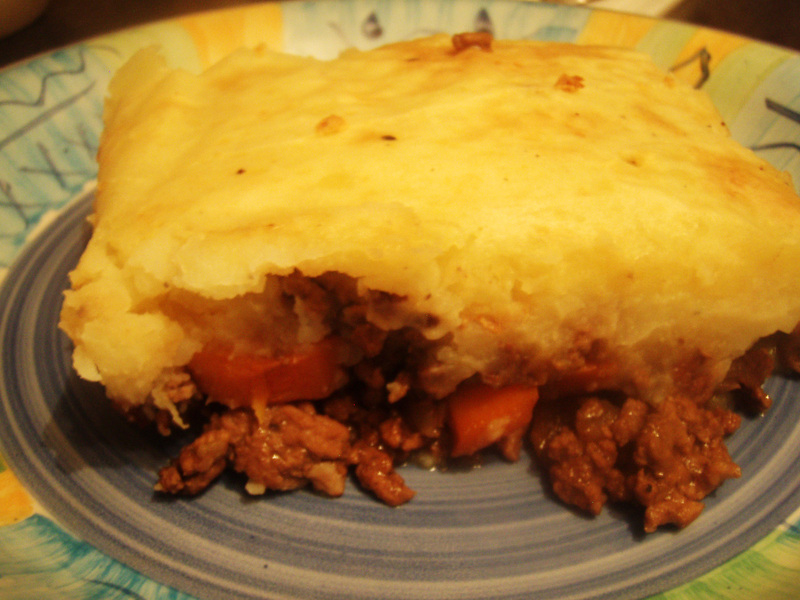 Place the meat mixture into a casserole dish and top with the mashed potato. 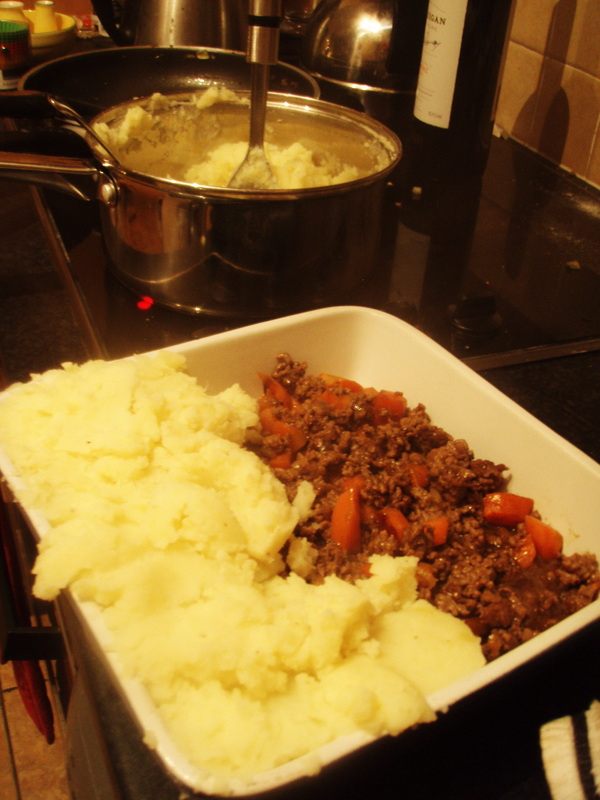 I’m quite pedantic about this part, I hate to see the meat and potato mix – I use a dessert spoon and add the potato one spoon at a time starting at one side of the dish and work my way round until it is full. You can then run a fork over the top for decoration or smooth it out. Bake in the oven for 20 minutes or until the mash is nicely browned. I generally serve this with peas. Be warned, this is seriously tasty, so good that we nearly scoffed the entire dish between the two of us! !